B.A. Patty was recently embedded with the Armed Forces of the Philippines. In part three of the series, Patty discusses the role investments – in the NCO corps of the AFP, in the local economy – play in counterinsurgency. Zamboanga, Philippines: When members of the terrorist group Abu Sayyaf settle into the jungles of Jolo, they find themselves opposed by forces the US began to help a hundred years ago. Progress in the Philippines, especially the progress made in recent years, shows that a decade-long investment pays generations-long dividends. 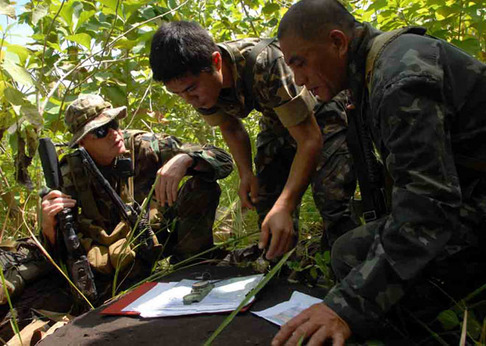 A function of the US Naval Special Warfare is to conduct subject matter expert exchanges, workshops in which useful techniques are taught and then practiced in the field. On Tawi-Tawi recently, a logistics combat element was teaching Armed Forces of the Philippines Marines from the 2nd Marine Landing Battalion an amphibious insertion technique called “over the beach”. The history behind the technique being taught was clear. Several elements of the technique, including the light signals, would appear to date from at least World War II. Other elements were newer, including the expectation of communications technology. That would seem to obviate the need for light signals, but they had not discarded the older systems. Redundancy is good in combat. The US Naval Special Warfare forces are the best in the world, in large part because they are the inheritors of these techniques. It is not because they are tougher than the Armed Forces of the Philippines’s Navy Special Operations Group.The NAVSOG go by code names, because of the danger to their families. They are brave and expert in their boat handling. They lack only two things that the US Naval Special Warfare has: techniques and technology. Both are the result of investment. The Naval Special Warfare unit has done subject matter expert exchanges in nations other than the Philippines, in fact pretty much everywhere in the Middle East. When asked whether it made a difference that the Philippine military was culturally similar to our own, the chief of the Naval Special Warfare unit said, “Absolutely.” He agreed that the strong NCO corps was a factor in the effectiveness of the AFP. One of the instructors gave the same answer to the question. He, too, had carried out instruction in similar techniques in several countries. The similar military cultures allowed understanding and cooperation to develop quickly. There was trust as well, particularly between the Naval Special Warfare and NAVSOG men. Indeed, at times the display of trust by the men of the Naval Special Warfare was astonishing. After the subject matter expert exchanges, the Marines were given some closing comments by their instructors. “I want you to know that you greatly exceeded my expectations of your capabilities,” one instructor told them. “You are now absolutely ready to perform OTB [over the beach] missions.” The Marines were dismissed. As they walked away, they began to strut with pride. If they are called upon to undertake such missions, they will have a confidence and an expertise that will help them. If not, they have a memory of working with American allies, and how proud it made them. When the US and its allies want to perform civil military operations, at hand are not only AFP and US Joint Special Operations Task Force-Philippines expertise, but also civilian agencies such as US Agency for International Development, which has been doing aid projects in the Philippines for 60 years. Traveling through Tawi-Tawi, the mark of USAID is observed everywhere. They have built a new water pumping station, painted the bright baby blue that they use to identify their projects. It makes it obvious to everyone where America has been, helping out. A new roof on a house. A dock for a people whose lives are the sea. A building, a home, a warehouse. An investment now, seen through, pays the children and grandchildren. But that is only half the story. At the time that the US ceased to consider the Philippines a colony, the people of Mindanao wanted to become an independent republic, or else to continue as a colony of the United States. The US did not honor their wishes. Against their will, the US forced them to accept government from Manila. The bad feelings that America encounters among some of the people of Mindanao today are not a relic of imperialism. They do not survive from the days of the insurgency following secession of the Philippines from Spain to America. They are, rather, an echo of a moment when the US failed to live up to its principles. The US did not set men free, but made them be what they did not wish to be. Such echoes linger. An investment made today, though it seems expensive, is repaid with interest in the future.So too do other choices. There is an AFP Marine unit stationed on the very edge of the line between the parts of Tawi-Tawi controlled by the government and those where the Moro National Liberation Front holds sway. Abu Sayyaf is out there too. Except for patrols, the AFP does not otherwise venture there. The camp is without power, and the Marines cook their coconut soup over an open fire. The place is swept clean every day. The men are disciplined, and they are proud. Their mortars, literally stored in the jungle, are spotless. The camp is not defensible, and there is no evidence that it has ever been called upon to be defended. There is a fence line, but nothing has been prepared to defend it, not even fighting holes. The first time it were to be hit, such holes would appear. This is part of a series of such camps, and while the patrol stops there sometimes, the camp has not been attacked. The line of camps is like a wolf marking his territory: The other wolves have known his mark and chosen to accept its limits. The cathedral in town is beautiful, but it needs a new roof. The priest spoke sadly of the violence in Mindanao, but said there was no trouble in town. The NAVSOG say that the Christians and Muslims in town used to be divided, but now live intermingled. It is legal for them even to marry here. The vice principal of the local high school is a wonderful woman, very kind. She spoke about how most of her students go to college, at the local extension, studying one of the agricultural disciplines. There are technical schools across the bay. Passing through Sanga-Sanga, on the southern side of Tawi-Tawi, means driving past warehouses full of timbers. They are good hardwoods, solid and thick. Each one would fetch hundreds of dollars in America, more in Japan. When asked about whether timber was a big export industry, US Marine Sergeant Smith said, “No, these are just for local use.” He then went on to describe how the timbers are made. They do not mill the wood. It is all done by hand, with chainsaws, as precisely as a sawmill could do. Even with strange and clumsy-looking axes, craftsmen building a ship were able to strike off perfect strips of wood. The place is impossibly poor. The signs on the wall are in English. Off the shore, in the middle distance, great ships pass by. It is the shipping route that runs from Malacca north to Manila, Japan, California. Thomas B. Gibbons, a counselor for political affairs with the US State Department, had been to Tawi-Tawi and was likewise bothered by the poverty. “What will it take?” he wondered, remembering aloud that USAID had been trying to help for 60 years. The UN is there too – its trucks are in the streets of Batu-Batu. What it will take is venture capital. What the area needs is not government aid, little of which gets to the people. It needs jobs for the people themselves. The benefit of jobs is that – although most of the money will go to the venture capitalist, and some to ease the process of dealing with the local political figures – there is money going directly to the families in the villages. It forms small pools of capital. More, since it is earned rather than given, it is spent by a mind that remembers working for it. People are always more careful with money they earn. An Naval Special Warfare medic, who served in Iraq more than once and whose family is from the Philippines, was also deeply and honestly bothered by the poverty. “I came because I wanted to help,” he said. He spoke of working at the medical civil military operations, but not of the people he was able to help; he remembered the ones he could not. The medicine ran out; or they were too sick and had no way to get to a real hospital. In China, where the government is far worse than the locals powers in Mindanao, the small pools of capital are starting to give people the power to push for a little more freedom. Mother Theresa was a fine woman, who changed life for many people, but she did not change India. Yet commerce, technology, investment, they changed India. Even in the best case, there are failures as well as successes. In 1996, Nur Misauri signed a peace treaty and became governor of the Autonomous Region in Muslim Mindanao; later, he went back to war and to jail. Today, the MNLF appears ready to accept the AFP’s control over Batu-Batu. Things are better, better overall, and not just for individuals. China is better today than 10 years ago. Sanga-Sanga is ready for the next step. Establishing economic prosperity is a key factor in counterinsurgency. But it requires the fortitude of economic gamblers to take such risks and succeed. Men have done just that and succeeded with personal financial gain and with assistance to the people of the Philippines. Timothy W. Chadwell, an American captain in the Philippine Coast Guard Auxillary, died this September. He came to the Philippines and fell in love; later, he started an airline. It grew, and as it grew he became wealthy, and as he became wealthy he bought more planes. He also started caring for children with severe medical conditions, who could be helped to live happier lives but only at great cost. Eventually he got a job that would pay his expenses, and sold his airplanes to have more money for the children. Memorial fliers were being handed out at JSOTF-P’s Manila unit. A young lieutenant was only too eager to tell me Chadwell’s life story. He died suddenly, but left behind a clear example. Sergeant Smith was the one who told me about Andy de Rossi, an Italian who founded the Promotion of Peace and Prosperity Foundation. De Rossi likewise came to the Philippines and fell in love. He likewise made money, quite a bit, and then turned to helping the people. Recently, he bought 30 fully-stocked ambulances at auction, imported them to the Philippines and gave them away. He started the first rescue service on the island of Jolo, where most of the recent fighting has been. Someday soon, someone is going to make his fortune in hardwoods from Tawi-Tawi. He will find a skilled, willing, English-speaking workforce. He will find it cheap and easy to get the goods to the shipping route that takes it to Japan or California, where he will get the best prices in the world. He will find that Sanga-Sanga is “going green,” as the Special Forces soldiers say. The AFP will be there, better trained and equipped than they were before. They will continue to fight the next leg of their part of the Long War. Though there will be fighting, there will also be new chances and new hope for the people of Sanga-Sanga. In time, the villages behind them will share in it. Much of the conflict will be decided by good works, or by people making themselves and others wealthier than they were before. This can be thought of as war, as the end stage of counterinsurgency theory. It can also be thought of as investment, too. It is close enough to war to be war, and close enough to peace to be peace. Someday the great ships will no longer just sail by, and the people will know prosperity. That is the work of the Long War, and of JSOTF-P. Working through, by, and with its allies, the US is helping make the conditions for prosperity, and for peace. Great piece, B.A. Patty ! Thank you. This is just testament to not only The Long War but the Wide War. And it shows more than anything, the professional dedication of U.S. troops throughout the world. I wonder if the folks at Project Kiva (www.kiva.org) might be able to help with the microfinancing? Perhaps you could drop a note to them. All the Jihad news for Today, 10-23-07. Some of this is a few days old because I was busy over the weekend. I don’t make any money here, so this is spare time.